My friends over at Invite Only Management are throwing a rager down in Arizona. If you happen to be in Tuscon the first week of May, this show is a must see! 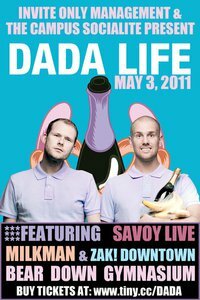 Dada Life will be heading the party and Savoy, Milkman, and Zak! Downtown will be helping the party live on. Savoy is a progressive house band with some Pendulum like sounds. I really like what their new stuff sounds like. Check them out, and if you’d like to buy tickets, you can do so here. Don’t miss out. Posted on April 12, 2011, in Bass, House and tagged progressive, savoy. Bookmark the permalink. Leave a comment.